Why do we Aussies get so carried away with the word ”hero”? On the one hand, any Aussie, who has won a garish plastic trophy or a middling beribboned medal in, say, the South Poowong Rugby League or the Synchronised Gargling at the Pub Pong Olympics, is a hero, a bloody hero, mate. We don’t care if he does drugs, takes bribes or wins Dickhead of the Day by running around naked with a lit firecracker up his bum; if he wins and gets away with it, he’s a hero, a bloody hero. On the other hand, what with the droughts, the fires, the flooding rains and being girt by sea and all, we Aussies do need heroes and, thankfully, these men and women turn up at the worst of times and earn their pat on the back. So the job description for the occupation of Aussie Hero ranges from ”drunken yob” to ”risking your life for others”. Meanwhile, if we had a Heroes Hall of Fame, you would hear the echo of your own footsteps as you walked down a hollow empty hall that boasted three inductees: Don Bradman, Phar Lap and Ned Kelly. Not one of them risked their life for the benefit of mankind or even saved a stray cat from up a gum tree, but they are heroes, mate. We respect our VC winners. But we don’t put them on a pedestal. Name one. So drunken yobs, dickheads, bushrangers, batsmen and a horse are our heroes. 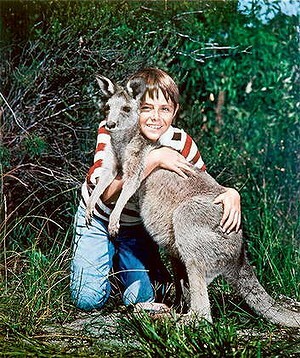 This entry was posted in Articles and tagged Aussie Heroes, Aussie Heroes Hall of Fame, drunks and dickheads, Farlap Rides Again, In Search of an Aussie Hero, Kerry Cue Canberra Times, Kerry Cue Columns, Kerry Cue comment, Skippy is our hero, skippy the Bush Kangaroo by Kerry Cue. Bookmark the permalink.